I uploaded my very first Xbox One gameplay videos last night and they turned out great. You can view them via our official XBOXONE-HQ.COM YouTube channel here - http://www.youtube.com/XONEHQ - Make sure you subscribe if you like Battlefield, Call of Duty and all of the top games as I plan to record gameplay for most games. Anyway, check out XONEHQ's first exclusive Xbox One gameplay videos on YouTube or via XBOXONE-HQ in our forums here. 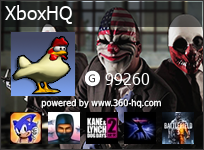 I've also started a new thread on XBOXONE-HQ for anyone who wants to get involved. enjoy the sites and see you on Xbox Live!